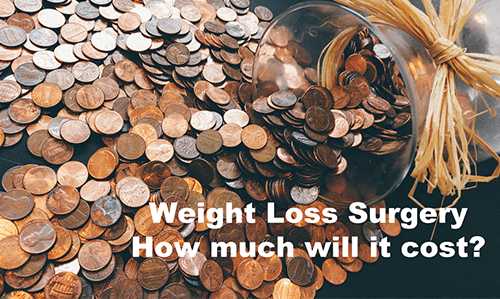 Patient Centre Weight Loss Surgery: How much will it cost? Weight Loss Surgery: How much will it cost? Metaphorically speaking obesity surgery, be it a gastric band, gastric sleeve or gastric bypass, is as cheap as chips. That is, if you were to calculate how much money you’ll save from not buying the foods that attributed to your obesity, you’ll probably find that it’s much, much cheaper. Calculate that same figure over many years and you’ll actually turn a profit! Because obesity is considered to be a clinical disease, any treatment for it, including weight loss surgery, is covered by all reputable private medical insurance companies. Unfortunately, this kind of treatment is not yet readily available through Medicare. If you don’t have a private health care plan don’t worry, there are many affordable options available to you. The cost of weight loss surgery includes the consultation, surgery, specialists and surgeons fees, hospital and anaesthetists cost, plus it also covers the after-care, follow-ups until and after you reach your goal weight, dietary plans and much more.